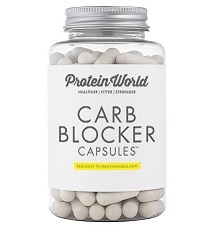 Protein World Carb Blocker is a dietary supplement for weight loss. It’s a natural food extract that claims to stop the body from storing unused sugar as fat and inhibits the digestion of carbs. It is advertised as a powerful carb blocker, giving consumers the impression that it can help prevent the body from absorbing a percentage of carbs from food, and as a result, can help support weight loss by decreasing the absorption of excess sugar that can be stored as fat. When this review was written, the ingredients in Protein World Carb Blocker include: White Kidney Bean, Garcinia Cambogia, Chromium. Each of these ingredients have been studied. For instance, research has found that white kidney bean is a source of dietary fiber that may help to increase the elimination of fat from the diet and can decrease the absorption of starch. That said, there is conflicting evidence regarding white kidney bean’s effectiveness as a starch blocker. While some research has found that when taken at a significant dose (1000 mg three times per day) it may help obese individuals who eat high amounts of carbohydrates, other research has found that it has no effect on weight loss at all. As for garcinia cambogia, some research suggests that it may prevent fat storage, control appetite and boost exercise endurance. That being said, whether or not it can actually produce these effects in humans remains to be seen. Ultimately, while each of the ingredients in Protein World Carb Blocker are popular in the over-the-counter (OTC) weight loss industry, none of them have been clinically proven effective for causing or assisting in weight loss. Since this is the case, there is no guarantee that taking Protein World Carb Blocker will be of any benefit to your weight loss goals. Moreover, you should know that simply because this dietary supplement contains all natural ingredients, this does not mean it is without side effects. On the contrary, there are potential unpleasant side effects associated with this product`s ingredients, such as gas, bloating, constipation, diarrhea, headaches, nausea, dizziness, etc. The recommend dosage is to take 2 capsules 30 minutes prior to a high carbohydrate/high calorie meal with a glass of water. Users are cautioned not to exceed more than 6 capsules in a single day. Before taking Protein World Carb Blocker, play it safe and consult your physician.